With engaging LIFEPAC 1st Grade Science, student's will jump into worktexts that explore God's beautiful world! Students will cover captivating themes like: You Learn with Your Eyes, More about Your Senses, God's Beautiful World, All about Energy, and the Wonderful World of Science. Filled with fun activities and colorful illustrations, LIFEPAC 1st Grade Science is also flexible for self-paced learning. Additional skills such as drawing colors and shapes, matching objects, and defining objects with words are also included. 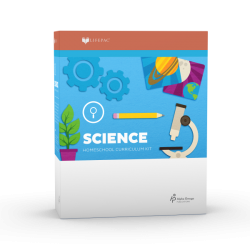 The LIFEPAC 1st Grade Science Set contains ten separate worktexts and two teacher's guides.